Your 2017-18 Atlantic Coast Conference champions pose for the official photo, celebrating a long awaited and deserved conference championship (Cindy Rice Shelton photo). 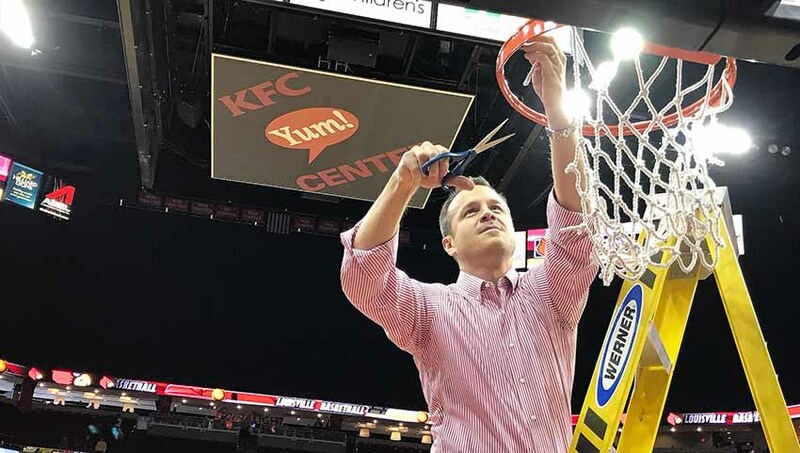 Myisha Hines-Allen was the first player on the ladder cutting the net following the University of Louisville women’s basketball team’s 81-49 win over Pittsburgh. A special day for Myisha and UofL, an exuberant ending to the regular season. Myisha Hines-Allen prepares for her final regular season game at Louisville during pre-game ceremonies for the team’s only senior (Cindy Rice Shelton photo). 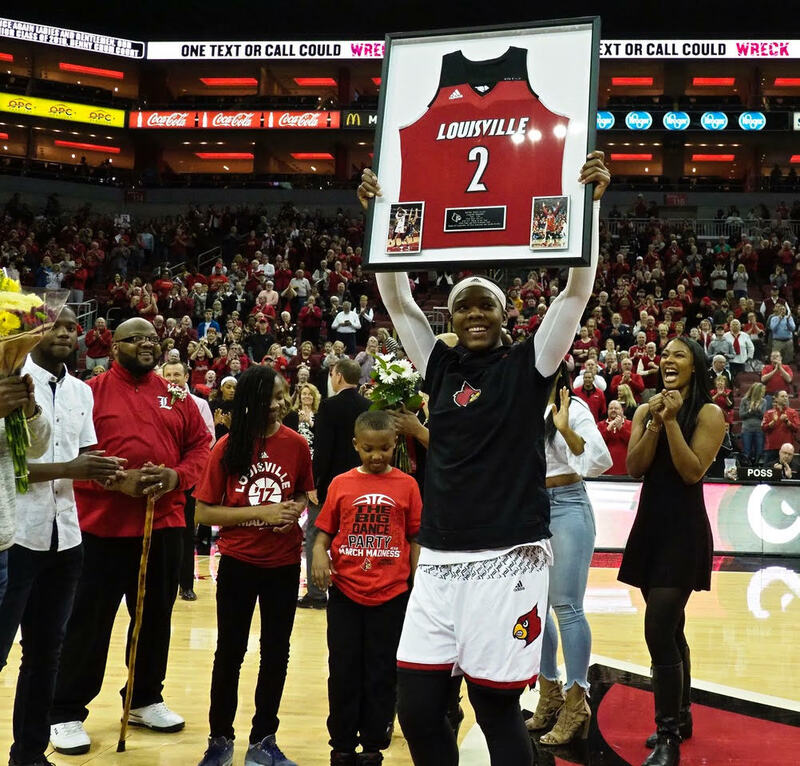 Senior Day for Hines-Allen, the only senior in the 2017-18 class, her family on hand, cousins and friends, along with 10,431 adoring fans at the KFC Yum! Center. The video tributes from fans began before the opening tip, continued throughout the game, and followed the cutting down of the nets. Special day for the entire women’s basketball team as well, winning the Atlantic Coast Conference championship, their first conference championship in 17 years. Officially they tied for first with Notre Dame but the nation saw the Cardinals trounce the Irish by 33 points in January. There would be no distractions despite all of the attention. Hines-Allen could do no wrong in her final regular season game, scoring 18 points and grabbing 16 rebounds for the 43rd double-double in her four-year career. Her layup with 5:37 left in second quarter allowed her to pass Nell Knox (1,899 points) for third all-time in scoring for Louisville. 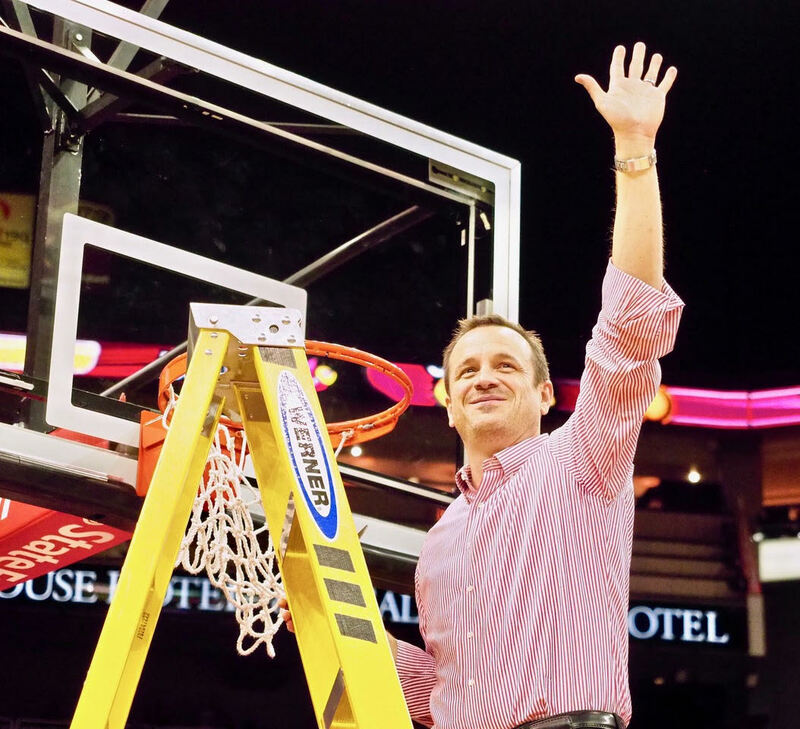 Jeff Walz gets that ACC conference championship for the 2017-18 season (Cindy Rice Shelton photo). 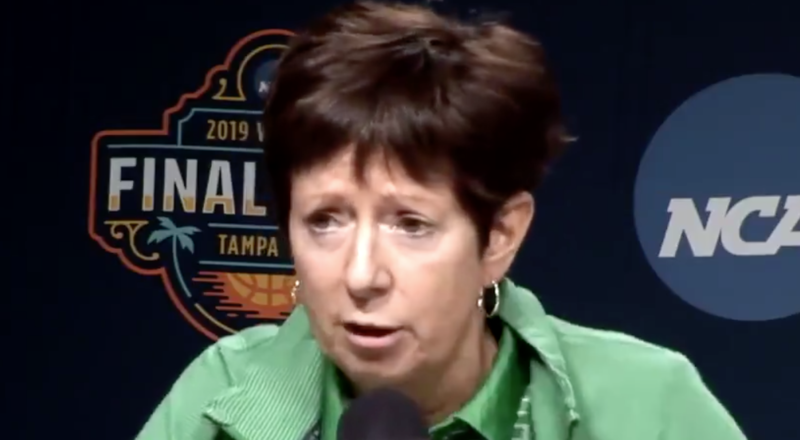 She would leave the game to a standing ovation at the 3:33 mark, the applause continuing after play had resumed on the court. Afterwards she would pose for the team photo and foist an ACC championship high above her head, taking a victory lap around the court. 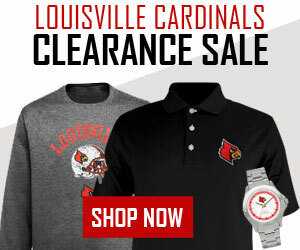 She would catch the championship net from Coach Jeff Walz and wear it around her neck to the post-game press conference. 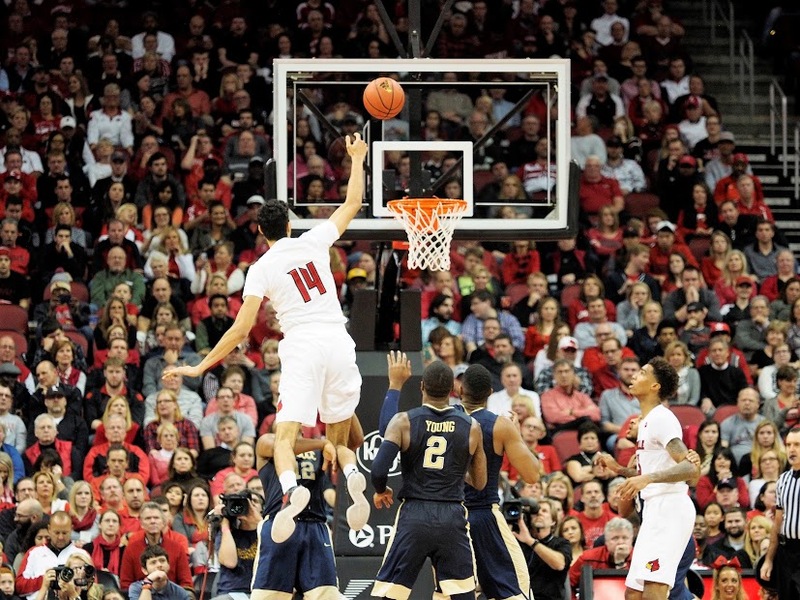 Louisville is 15-1 in conference play and 29-2 and is the No. 1 seed as it prepares for the ACC Tournament in Greensboro, N.C. The Cardinals earned a double bye and will play their first game at 2 p.m. Friday. 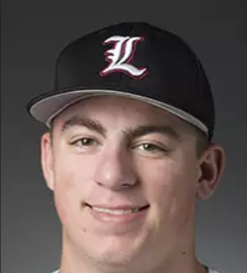 Brendan McKay and company were more than ready for the conference portion of the University of Louisville baseball season to begin on Friday. 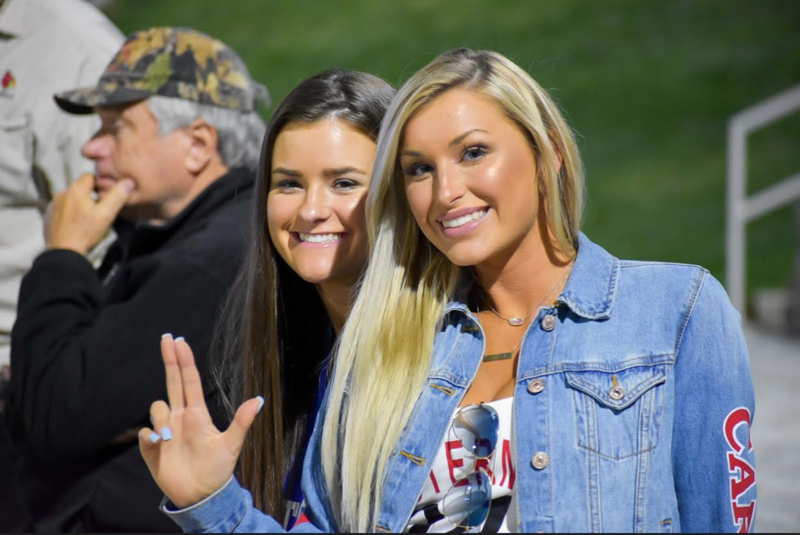 The Cardinals would post a 3-0 win over Pittsburgh before a crowd of 995 fans in 50-degree temperatures at Jim Patterson Stadium. Brendan McKay striking out seven of the first nine batters on a 15-strikeout day. McKay continuing his impressive start to the 2017 season, fanning seven of the first nine batters he faced while racking up a total of 15 strikeouts for the game. The 6-foot-2 lefthander would allow only three Pittsburgh batters to reach base in seven innings, giving up two singles and a base on balls. The Panthers were held hitless until the fourth inning when Frank Maldanado reached base on a drive to right. 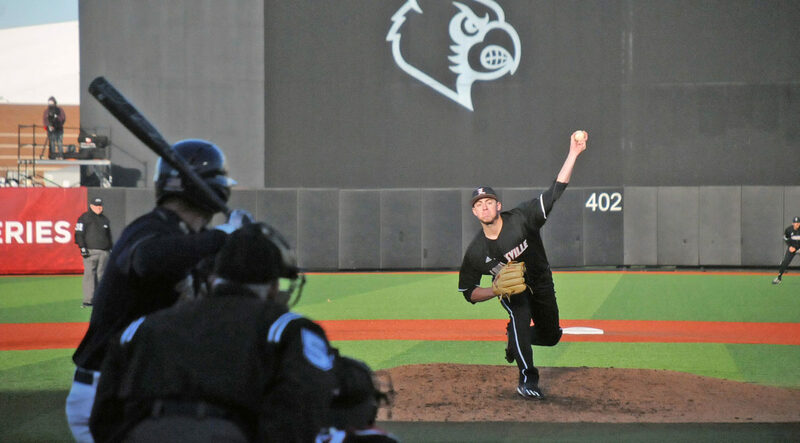 McKay entered the game with an 0.84 earned run average, raising his won-lost record to 3-0 for the season. 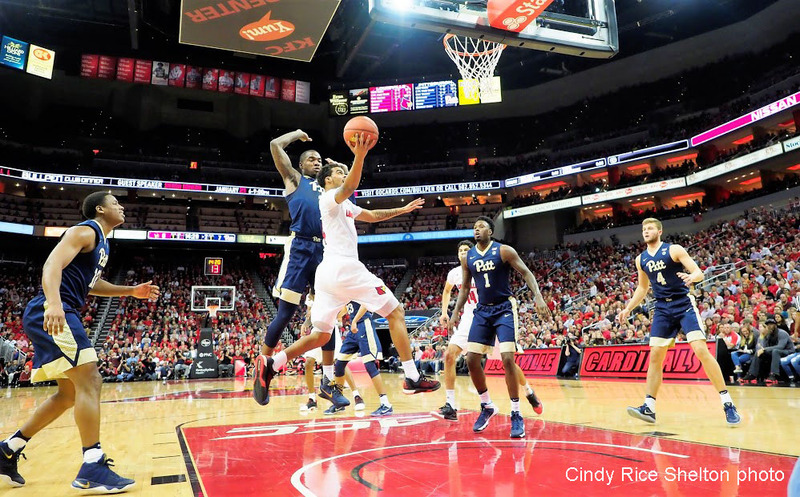 The win improved UofL’s record to 13-0 overall and 1-0 in the Atlantic Coast Conference. He would be held hitless himself for the first time this season in four at-bats. One of them was a sacrifice fly, however, driving in a Louisville run in the third inning. McKay’s batting average is still a hefty .613. Reliever Lincoln Henzman preserved the shutout for McKay, entering the game in the eighth, striking out three batters, giving up one base on balls but allowing no hits. 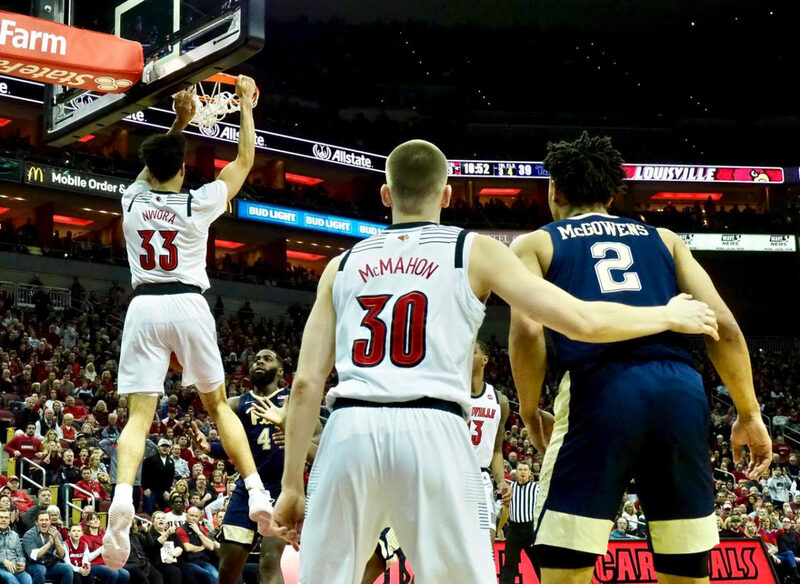 Complete run-aways are rare in college basketball these days, even more rare for the University of Louisville which prides itself on defense and, more often than not, struggles on offense. 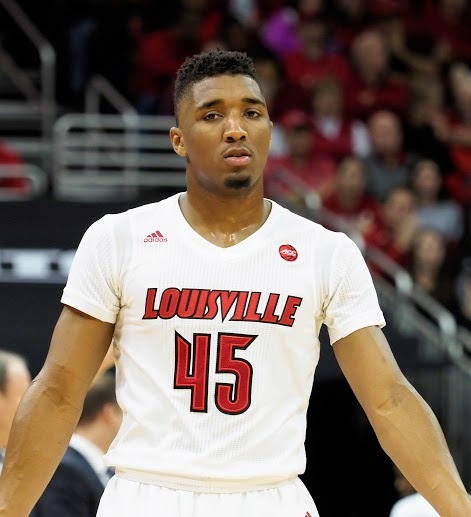 Donovan Mitchell with a career high 29 points (Cindy Rice Shelton photo). 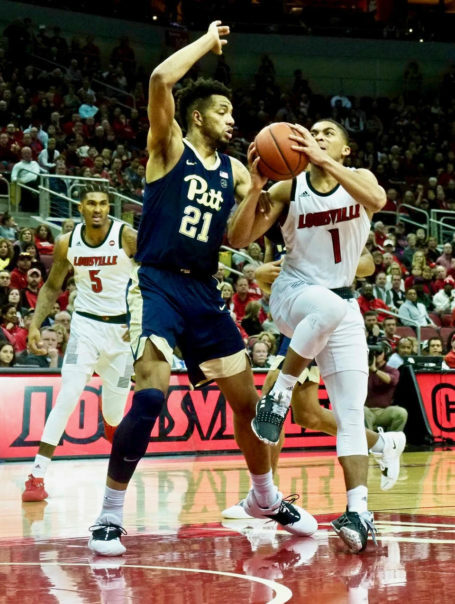 UofL had its act together, clicking on all cylinders, denying the Panthers any semblance of self-respect in a 106-51 win on Pitt’s home court Tuesday. Louisville jumping on top 51-18 at the half and never looking back. 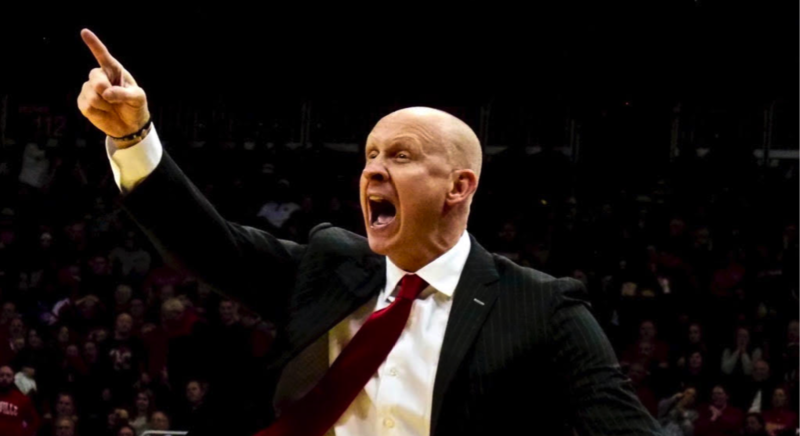 Such a thorough and complete trouncing that Pitt coach Kevin Stallings had had enough, collecting two early technical fouls, allowed to leave the game early. Actually he was ejected, but he really didn’t want to be there. Donovan Mitchell, highly motivated following a six-point performance in the loss to Florida State, taking his game to a new level. Fearless, aggressive, confident, his best collegiate performance with 29 total points, including hitting six of eight shots from behind the 3-point line. Anas Mahmoud, resembling Kareem Abdul-Jabbar at times, making up for a disappearing act against Florida State. 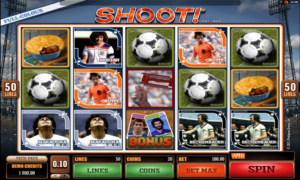 Some day soon, hopefully in late March, he’s going to put three or four good games together. Making all seven of his shots in this one for 14 points. Couple of blocks, one of them traveling half way down court, and two steals. Ryan McMahon maybe providing a preview of his future, drilling five of eight 3-point attempts. Five assists is equally impressive. Louisville has now won the last 10 games against Pittsburgh. Never taking the Panthers lightly, unfortunately for them. Things were going swell for the University of Louisville basketball team, amassing a 26-point lead over Pittsburgh early in the second half, the Cardinals possibly expecting the Panthers to roll over. Or maybe it was just taking Kevin Stallings’ team until the 17:16 mark in the second half to figure out how to compete with Louisville. Fortunately, Pittsburgh would run out of clock, UofL hanging for an 85-80 decision before 21,558 fans. 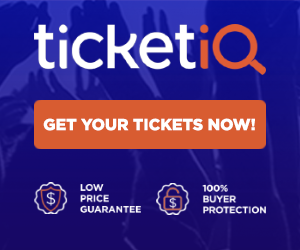 A learning opportunity for the visiting Panthers, which may be better prepared when UofL travels to Pittsburgh for a rematch in less than two weeks on Jan. 24. Not a big secret about how the Panthers made it a game — just get the ball to Jamel Artis and let him shoot. The 6-foot-7 senior, who had 11 points in the first half, would connect on 11 of 15 shots, including seven 3-pointers and six of eight free throws, for 43 points for the night. 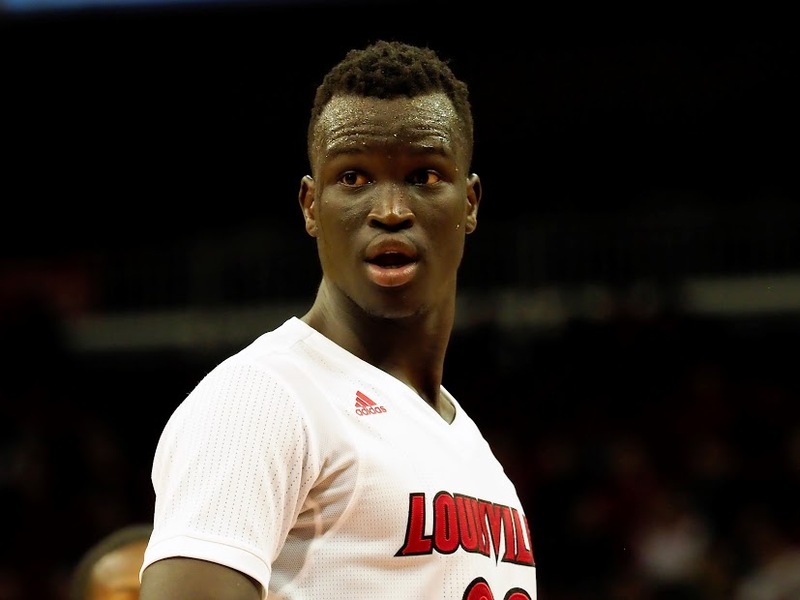 Deng Adel was back after his concussion, scoring 15 points (Cindy Rice Shelton photo). Pittsburgh would, in fact, make eight 3-pointers in that second half, winding up with 12 for the game. Snider would lead the Cardinals in scoring with 22, scoring 11 of them in the second half. Donovan Mitchell, Deng Adel and Ray Spalding would contribute 15, 15 and 11 points, respectively. Pittsburgh looking forward to a second chance and even more time to figure UofL out, next time on the Panthers’ home court. Anas Mahmoud looked good but his shot was off in a four-point effort (Cindy Rice Shelton).